Answering services act as a conduit for communicating with your current customers, potential customers, peers, employees, and anyone else who contacts your office. They are made up of individuals who, as an extension of your office, help to manage business and personal communications through the use of scripted messaging software and training for your industry. The invention of the telephone sparked a fundamental shift in which we communicate with one another. It not only changed how we communicate, but the speed at which it is performed. 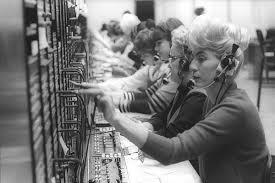 The early days saw the use of switchboards at the phone company, where only women were hired for the job. After showing promise, airline and hospitality industries quickly recognized the need for having a central place for reservations to be handled. Soon, other companies began using in-house operators to take and deliver messages to their employees. In an effort to duplicate their success, businesses large and small began outsourcing their telephone answering to answering services for 24/7 availability. Technologies such as pagers, cell phones, computer-based, and cloud-based messaging systems again transformed the landscape of communication to help make the answering service industry more efficient, and their abilities exploded. 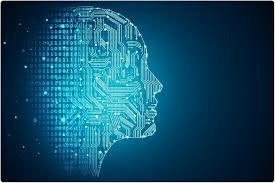 Today, artificial intelligence, voice recognition software, and continual innovation expand the possibilities of communication even further. Through it all, however, the need for a live voice option still remains a viable and important part of business operations. When you use an answering service your call, web chat, or text communication relays to a forwarding number via a direct inward dialing number (DID) and then is routed through an automated call distribution system (ACD). Calls can be screened by a front-end automated attendant or they can be routed directly to a live customer service representative (CSR). Your account information automatically displays on the CSR’s screen as they answer your call. Account information pages, scripted prompts, and dynamic information based on the caller's answers to scripted questions help the CSR to respond to your client or potential client and gather information according to your specifications. What happens next depends on your account protocols. Callers needing to have their calls escalated to someone in your office are then transferred or patched. If no further assistance is required, the message is reviewed for accuracy and delivered according to your desired method of contact such as fax, email, text, or telephone call, or inserted into your Customer Relationship Management , Practice Management System, Electronic Medical Record, or other third-party software via an application programming interface(API). EXPERT TIP: In the answering service industry, the number of rings are counted in one second intervals with six seconds being equal to one ring. To determine an answering service company’s service level, calculate the number of calls that were answered before a predetermined time threshold (usually this is 20 seconds). 1) Who is answering my calls? Ideally, you should have someone answering your calls who understands your business and is trained in the protocols on your account to deliver the caller experience you want each time they answer. A caller's experience is effected by many variables, including the CSR's account knowledge, tone of voice, and the experience level of that CSR. If your answering service is coming into contact with protected health information (PHI) then they should be incorporating best practices for answering service HIPAA compliance as well. 2) How does the answering service know who to contact? Your account is programmed with a roster of employees, their titles, and contact information. Answering service accounts are routinely pre-programmed to escalate calls according to the customer’s needs. Intelligent scripting and call dispatching allows your calls to automatically escalate, or seek out, the next contact in your account’s protocols. Newer technology allows for automated "queuing" of the accounts on the representative's screen, minimizing the need for manually setting reminders to check back on a message account to try to reach the contact again. This results in faster delivery with fewer minutes of work time, saving you money and delivering a better customer service experience. 3) How can a representative understand my business? Industry norms for CSR training duration, content, and quality vary widely in the answering service industry. Duration can range from one day to several weeks, depending on the service, resources available, client mix, and thoroughness of the training. Training will typically include the proper use of software and hardware to answer calls and may also include call handling instructions and specific account education. Data privacy education, such as HIPAA training, should also be included, as your answering service is considered a business associate of your company. Training is often an area for answering service companies to cut costs in order to maximize profits. This is a shortsighted savings that results in poor service and even worse representation for the client, costing them much more in lost clients, damaged reputation, and potential legal claims. Dedicated, ongoing training is necessary to ensure that the callers and customers of the answering service are greeted with the knowledgeable help they need. 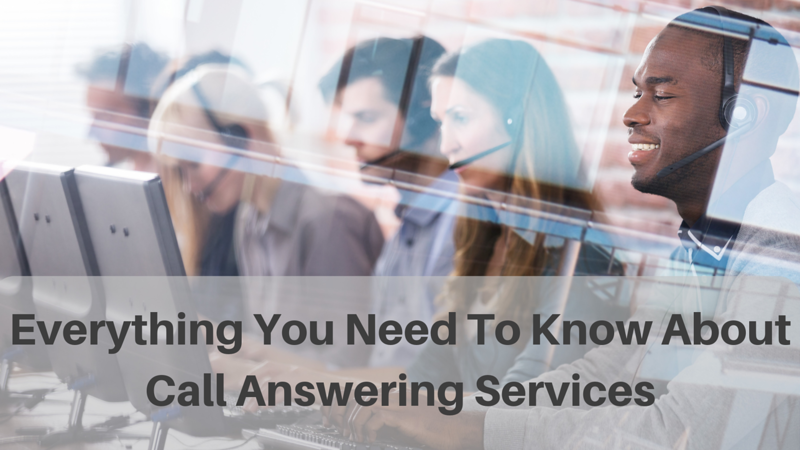 4) How large are answering service companies? The size of answering companies varies greatly, with operations ranging from a handful of representatives to some that employ hundreds in one location. In addition to the customer service representatives (CSRs), reputable answering services are made up of operations supervisors who manage and direct their CSRs to ensure that service levels are being met and client expectations are upheld. Customer service, billing, training, and quality assurance are also departments that make up the staff of some answering services. 5) How will my calls be handled? The way centers handle calls vary. For example, multiple calls can be answered at once by placing the caller on hold. These are what are known as multi-call environments, and the emphasis will be placed on how long the calls are placed on hold (in order to juggle more than one call at a time) and how quickly a call is answered. Single call environments allow for only one caller to be spoken with at a time. Automated greetings (instead of live answering) are typical, allowing additional time for a CSR to answer the call. The use of automated greetings will depend on the client, their needs, and what the staffing model is for that answering service. There are pros and cons to each system, and one is not necessarily better or worse. The bottom line is always—How well are your customers and callers taken care of? And, is the answering service meeting and exceeding your expectations? Some answering services utilize remote CSRs to answer calls, who will answer your calls from a location other than their headquarters such as their home, in addition to in-house staff. This offers the answering service flexibility in scheduling, redundancy, and availability. It can also be an incentive when hiring representatives. And, can result in lower hold times and faster answer times due to better staffing. Remote answering also means remote supervision of these team members, and the responsibility will be placed on the supervision and management teams to support and ensure the remote representative's call quality is the same in-house and away from the office. Ask the service you are considering about their remote agent policies- how do they supervise them, ensure Privacy/HIPAA compliance, and maintain quality while answering remotely? Dr. Steven Covey's advice to begin with the end in mind is wise counsel. When deciding if you need an answering service, begin by asking yourself, "What are my business’ goals that I am looking to achieve by using an answering service?" Clarifying what you are trying to achieve will allow you to weigh the benefit you are seeking against the cost of the solution you are considering. According to an Answering Service survey by Clutch, most business choose the partner with an answering service for 24/7 availability, better customer service, handle high call volumes, maintain relationships with clients , or increase staff productivity. It is not uncommon for small businesses to want to lend legitimacy to their company by hiring a full time or part time answering service. Professional customer service representatives can make your office appear to be larger than it actually is, at a fraction of the cost of hiring full time staff. Being available 24/7 also tells your clients and prospective clients that you take their needs seriously no matter what time of day it is. .
Types of Organizations That Benefit Most From Outsourcing Their Answering. Outsourced answering services is a particularly good investment for organizations that don’t employ a large, in-house team specifically dedicated to their customer communications. You might have a few people (or zero people) tasked with responding to your website chats, your email, your advertising generated calls, or your after-hours calls—i.e. all those big communications that you have trouble keeping up with. Understandably, you probably don’t want the overhead that comes with hiring a full-time secretary, scripting team, trainers, programmers, system engineering staff, quality assurance team, or supervisory staff to oversee it all. Most answering services have all of those experts on staff and more! And the best part is that you only pay for what you need, when you need it, and you don’t have to worry about benefits or turnover costs every month, which can save a lot of money— and enjoy the benefits of answering service without skimping on quality! 7 Common Reasons Why Businesses Outsource Their Communications To An Answering Service. 1. They have no real strategy for their answering/communications. There’s no limit to the kinds of communications and answering solutions a professional answering firm can produce. You can task an answering service to help rebuild your voicemail protocols, plan and execute your communications continuity strategy for your business, design your call scripting for response to digital ads, train your staff on how to best represent your business on the phone, provide redundancy in emergency situations, answer for you during meetings, lunch, or after hours, or integrate your messaging with your customer relationship or business management software. And they can do all of that in accordance with a strategic plan! Not to mention they can effectively analyze the results of said plan – and refine it accordingly. Ever hear money going down the drain in your business? It sounds just like a phone that rings and is never answered. Today's busy business owners can become overwhelmed when they are trying to do their “day job” and answer phone calls at the same time. Added to this frustration of having to do more with less, is the constant fatigue that job switching causes. While multitasking seems like a great idea, there is evidence that shows multitasking is in reality, just switching jobs quickly, and it is highly inefficient. This leads to burnout, unproductive work, and unhappy employees. Sadly, once you have unhappy employees, you can be certain that you will also have unhappy customers too. If you have become lost in the weeds, trying balance a long list of initiatives with daily operations, you could probably use some outsourced assistance. Get back to what you do best, while your outsourced answering team becomes the primary handler of your phone calls, communications, website chat response. 3. Their answering is not getting performed consistently. Consistency is a key component of successful business operations. So many business owners, even those who have dedicated front-desk professionals, simply lack the bandwidth to regularly and consistently handle their communications. An answering partner can help you build enough steam to consistently meet both your current and prospective clients' expectations. 4. They want/need to take their customer service to the next level. Ever have a contact with a business that strikes a chord and then you think to yourself – Wow, I wish I could make that kind of impression with my clients! That is one of the defining moments  for your business waiting to be seized and built upon. Enter an outsourced answering service partner. They’ll provide the resources and expertise you need to upgrade your availability, sharpen your messaging, and leverage the latest and greatest tools and technology to capture your callers. 5. They believe they can “let go” and partner with a trusted answering team. It is very difficult for a business owner or manager to allow any portion of their operations to be outsourced. At the onset of an outsourced answering partnership, there may be a few growing pains, but a professional service will be able to quickly adapt and proactively make changes to meet your specific needs. A reputable answering service partner will work tirelessly to build a thick layer of trust into their partnership plan with you. Viewing the answering partnership as just that—a partnership—will be a critical determinant of success. 6. They know that you can’t get all of the skills they need in a single hire. The beauty of outsourcing is the practically limitless access to resources. Adept in-house hires may be able to tackle some answering and web chat, but can that individual additionally handle more lines, other work, scripting optimization, and all the specialties today’s communications landscape calls for in order to stand out? It is hopeful thinking, but highly unlikely. An answering partner can be that jack-of-all-trades, super specialist for every communication touch point that your operation has. 7. They feel overwhelmed by the many ways that communication is changing—and changing fast! Who has the time to keep up with all the trends taking shape across the communications world? Well… an answering service does. The right answering service’s employees live and breathe communication, and because there’s a collection of experts specializing in various areas, you will have all of your bases covered. 1. What pattern do your calls arrive in over the day and week? Calls typically arrive in three different patterns- smooth, peaked, or random. Smooth call arrival is distributed evenly. Calls are spread out evenly during the day and not many calls come in simultaneously. These even call volumes allow you to make straight-forward decisions about the priority of work that is done on and off of the phone and leverage outsourcing, such as answering services, to perform work that is not the most valuable use of the skill sets and time of you and your staff. Peaked call arrival patterns show large spikes in call traffic over the course of the day. This is where answering services excel. When you receive multiple calls at once, such as the days leading up to a holiday, before the office opens, during lunch time, or when you run advertising campaigns you must have the staffing to absorb that call traffic. Professional answering services are well suited to handle exactly these situations because of the time and resources devoted specifically to workforce management , automated call distribution, scripting software, sophisticated programming and multi-call training. Random traffic patterns are exactly that- random. These are also known as Poisson distributions, after the mathematician Siméon Denis Poisson, who is known for developing a model for the number of times an event occurs in an interval of time or space, exactly like what happens with a phone call. Answering services are also of great value in these situations because you do not have to hire, train, supervise, and schedule staff or worry about paying for benefits or overhead needed to keep up while still being available to respond to your customers and prospective customers at a moment’s notice. 2. What is the duration of your calls? Calls that last a long time drastically increase the odds that you will receive another call at the same time. You can thank Murphy for that. Fielding multiple calls can also mean placing callers on hold, breaking your conversation off, or missing another important call altogether. This is not a good look for your business and can be harmful to your hard earned reputation. 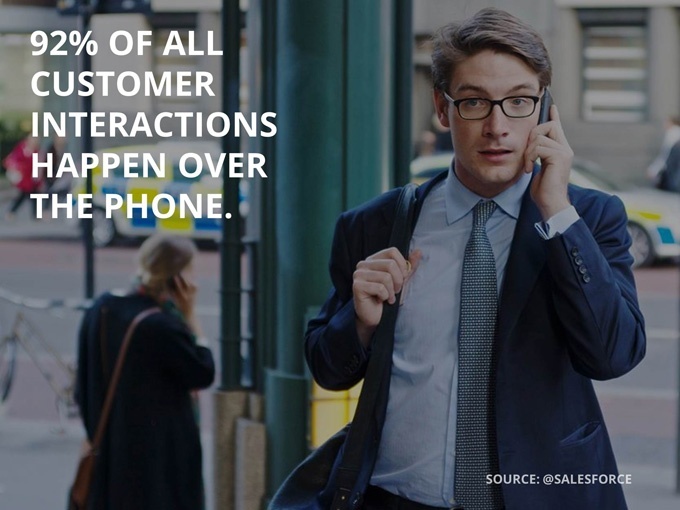 Expert Tip: Roughly 92% of all customer interactions happen over the phone. Missing calls, placing callers on hold, and rushing them off of the line to get to your "day job" can be doing serious harm to your business' reputation. 3. What is a call worth to you? A similar question to the previous one, but examined in a different way. What is the cost of a missed call to your business? The answer lies in what the call is about, of course. If you are missing a solicitor's call then it is not valuable, and may in fact save you money (i.e. your time) wasted. If you are missing a call from an important client or prospective new client, then the call becomes highly important and could cost you thousands of dollars. 4. When are your calls coming in? Are your calls arriving after office hours? During office hours? Both? If they are after hours, your clients or potential clients may have the expectation that you remain responsive to them beyond your business hours. Also take into consideration if you are running advertisements after hours or any holidays that may impact when calls are coming in to your office. 5. Do you have any plans that could impact these call volumes in the near future? What to consider here, are business activities that will cause changes to your call volumes. For example; have you gained a large client that will demand more of your assistance? Or, are you running a marketing campaign that will increase calls? Evaluating expected additional call volumes can give you a good indication if you have the resources that you need to keep up your call demand and day to day operations. 1. Increasing staffing levels~ If, after analyzing your call traffic, you discover that you have a smooth call arrival pattern, staffing may be the best option for you. Be aware of any necessary training, quality assurance, or scripting that may need to be in place to help your staff to answer their best. It is also a good idea to consider if that is the best use of that extra staff's time or if they could be doing something else that is of higher value. 2. Voicemail~ Many companies large and small rely on some form of voicemail to efficiently and effectively communicate with their customers. 3. Auto-attendant~ A version of voicemail, these electronic messaging systems route callers through a series of prompts to reach their end callers' destination. Auto-attendants can be blended with traditional answering service to screen out callers who may not need a live-voice answer. Now that you have examined some alternatives to answering services, your next step is evaluating your costs. This is where you will likely determine how the benefits of answering service that are possible stack up to the costs incurred. How Much Will Partnering With An Answering Service Cost? Answering services have received a rather poor reputation for billing practices. This is unfortunate, because there are many reputable small business answering service owners who operate with integrity, and really want to make a positive impact on their clients' businesses.To understand what an honest an upfront answering partner looks like, you will need to have a basic understanding of common billing practices and plan structures. The majority of answering service plans continue to use variable rate billing structures. This means that the bill you pay will be based on the amount of minutes or calls made on your account. When you receive a phone call and it is forwarded to an answering service, you begin paying the second a representative begins doing work on your behalf. Typically, you will purchase a "bucket" of minutes (called base minutes) each month and agent work time during calls you receive on your account is removed from the bucket as it is used. In this plan, any minutes used after this are called overage minutes, and are charged at a different (usually higher) rate. Expert tip : Your "bucket" of minutes and your rate is often locked-in once you sign the contract. Before you sign, ask your answering service partner if they are willing to scale your base minutes at the same rate if your actual usage is different from your projected usage. It is also important to know if your number of minutes can be adjusted for the first two to three months while you find your optimum call volume. Charging a base rate and overage rate allows the answering service to staff appropriately, as many services will staff their centers according to their client's base minutes. It can also mean that you will have a bill that can fluctuate slightly from month to month, and that you could be forced into a package of minutes that do not fit your needs very well. Be sure that you understand what constitutes a "minute", and are buying the amount of base minutes that are the best fit for the needs of your business. If your estimated minutes vary with the seasons, such as with service contractors (HVAC, plumbers, etc.) you may need to take this into consideration as you build your answering service plan. Other pricing methods may include per-call pricing . This is less commonly used in telephone answering services and is sometimes used in call centers. The trick here is to determine what qualifies as a call. Even if the caller hangs up, it may still count as a "call". "System work", such as texting, faxing, or sending email responses may be counted as a call. Other "calls" may include verifying that your lines are forwarded to the service when you leave for the day, or making changes to your account information. Per-call plans work when you are very sure that you will only receive a set number of calls per day, which is often difficult to predict. Make sure that you are clear about what exactly a "call" means to that answering service, and choose a package that best matches your expected call volume. It is always good practice to know what you are paying for. When you have a clear understanding of everything your bill will include, you are in a much better position to weigh your answering service choices. How To Choose An Answering Service. It's important you know who is representing you and who has access to your data and information, something that can't be guaranteed with lax training standards or overseas call center agents. When the power goes out, you still need agents to be there for your customers’ calls. Confirm they also have redundant back-up solutions for data storage, and telephony functions. Do they just react to customer complaints or do they proactively improve bymeeting with clients, reviewing call recordings, and seeking feedback? Most answering companies should have a full-time call evaluator that listens to calls for each agent on a monthly basis. If possible, dive deeper to learn what goes into an evaluation. Answering service is a partnership with your business. Would you rather work with a company that reports to you or to their shareholders? Ask who their parent company is and if they‘re publicly traded. Be sure that you will receive the personal service you deserve and are not viewed as another invoice. You wouldn't set a new hire loose with no orientation. An answering service is the face of your business. Onboarding with your answering service should be a thoughtful process and not rushed. 7. They have the capabilities and functionality to give you the custom solution you need. The needs of your business adapt and grow over time, and your solution for answering service should be the same. Customization will allow you to match your business goals with the latest tools and technology in a way that is easy to use and adds value to your business. 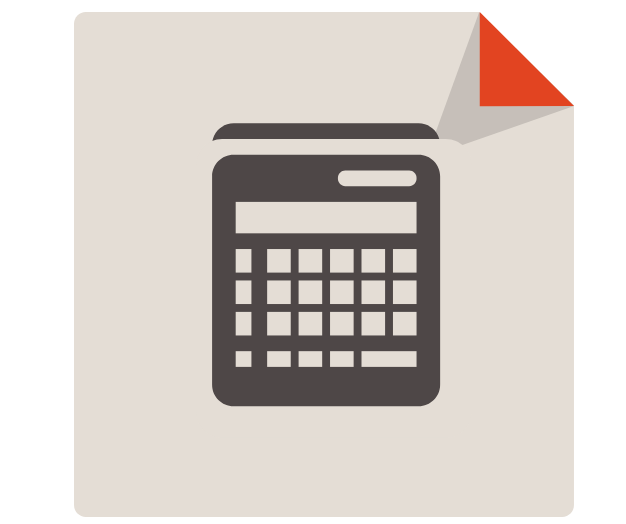 Watch out for billing schedules that look inexpensive but turn out to be filled with hidden fees! Ask about holiday fees, additional service charges, and whether they invoice you on a monthly basis or every 28 days . This could mean 12 vs. 13 invoices per year. Also find out how they define a work minute (a 30-second call could be counted the same as a 1 minute call). 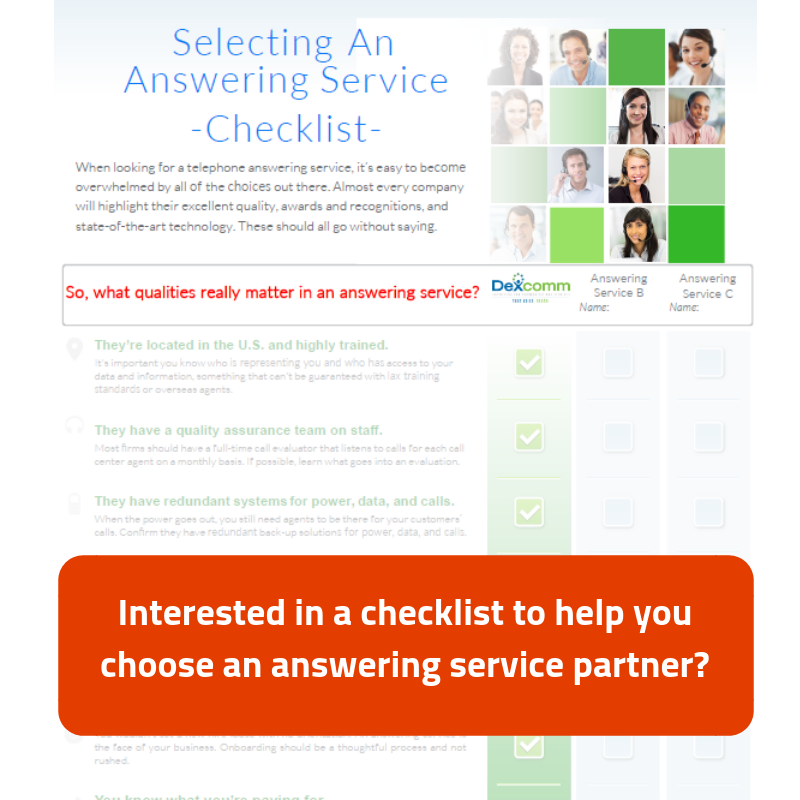 Download your copy of the checklist for choosing an answering service today! Already preparing to hire an outsourced answering service company? Great! Think you’ll never have to mention the word “communication” or “answering service” again? Not so fast… While it’s true that your outsourced answering service partner will take a huge chunk of work off your plate, you still want to sit at the table and be a part of the conversation. When interviewing potential answering services, make sure to talk about the goals you have for your business, the general budget you have to achieve them, and the timeline you hope to achieve them in. With an outsourced answering service, you can optimize your account regularly, so you have to be on the same page throughout this process. Decide how often and in what format you and your outsourced answering service will communicate with each other. Both of you must agree on the frequency and type of check-ins and accountability you need in order to be comfortable and successful. You may want to have a bi-monthly conference call to get an update on your account, a weekly review email summary or a monthly face-to-face meeting, for example. Meeting with your account representative is also a great time to review your answering service call reports. When you’re mutually clear about the best times and ways to reach each other, you pave the road to success. While an employee works exclusively for your company during his or her working hours, your outsourced answering firm can serve thousands of clients simultaneously. You should expect a high level of response from any partner you work with, but it is unrealistic to expect that an outsourced partner will be able to provide instantaneous response to every question or request. By setting clear expectations on communication and response times, as well as next steps, you will avoid a frustrating experience. The best outsourced answering partner will not simply take your direction, but execute. The right phone answering service will be a partner in your business—a partner that brings new ideas to the table, suggests new ways of doing things, gives you information and insights to make decisions, and pushes back on your ideas when appropriate. This is what you want in a successful communications relationship. The best businesses have teams that are collaborative and cooperative, with several people offering their talent, ideas and insights. But who looks out for your communications? There is a need to have a designated leader, a chief communications officer of sorts. For the most productive outcomes, the outsourced answering service serves as a consultant for your communications to be at their best. To be successful, your outsourced partner needs to have your trust and confidence so they can do their jobs and become a natural extension of your company whenever you need. Your account manager will have an easier time customizing changes for your account when they have a single contact to communicate with. A successful relationship with an outsourced answering group relies on an open, steady flow of communication so that your staff can use your industry knowledge and subject matter expertise to make meaningful, relevant improvements in your office’s communication with its clients and prospective clients. Success with your answering service is also dependent on providing feedback and sharing suggestions for improvement to your outsourced service – or assigning someone in your business to be the point person with them (see point #5) – so that your communications will progress efficiently. Your feedback, along with answering service account management best practices, are added to your answering service partner's institutional knowledge to further customize your solutions and represent your business with your core values exactly as you desire. Much of what makes up a great company culture involves a shared bond of values, and how much – or how little – your answering service presents these to your clients and prospective clients can make or break your reputation. While it’s critical to fill your needs for a communications solution, it’s just as important, however, to not jump at the first (or cheapest) service that can do the work for you. Give them the opportunity to give you a virtual tour, meet representatives that will be handling your calls, learn about their training, hiring and core values as part of your selection process. You will be proud of the way you are represented when your outsourced partner and your business share core values. Ready to outsource your client communications ? Measuring Success With Your Answering Service Partner. While quality for the most part subjective, there are still fundamental best practices for what is considered quality communication in an answering service. Partnering with an answering service, means that you are paying for an experience that occurs as a conversation, which should be monitored, analyzed, and improved with time. Because of this, a reputable answering service will have a quality assurance department or staff member that is ultimately responsible for measuring the quality of your calls. Their responsibilities should include monitoring, grading, and staff training—if required—to improve your calls. They should also have the capabilities to allow you to listen to your calls. You should listen to at least some of them, and provide feedback to your answering service. 1. Is the agent engaged? Does the CSR sound like they are smiling on the phone? Are they actively listening, or distracted? How is their tone of voice? Did they sound personable or indifferent. Does their messages reflect that they understand the key message details? - You are ultimately listening to determine if this is how you want your calls to be answered, and essentially determining if services rendered are meeting your quality standards. 2. Do they sound prepared to answer? - If the CSR fumbles through the script, it can lead to a less than stellar impression and possibly harm the reputation of your business. 3. Does the caller sound happy? - The caller should not sound upset, confused, or dismissed due to the CSR they are speaking with. Tracking the success of your live voice answering service partnership is a solid business practice. In the answering service industry, the number of rings are counted in one second intervals, with an average time of six seconds being equal to one ring. To determine an answering service company’s service level, calculate the number of calls that were answered before a predetermined time threshold (this is generally 20 seconds). Divide that number by total calls possible. Why it matters: A caller's experience with an answering service begins to be formed when they wait to be answered. Service levels will show a global indication of how any calls are being answered in a timely manner. This is evidence of proper staffing, good call distribution, and a baseline of determining the quality of service you can expect. The number of seconds in which an individual call is answered by a CSR is averaged to determine the average time to answer, also called the time to answer (TTA) or average speed of answer (ASA). The industry standard for TTA is 20 seconds, or about three rings. Why it matters: Your callers, many of whom are customers and potential customers, expect prompt service. Just how promptly their calls are getting answered is shown by the answering their calls in a timely manner can be proven with the service level. Beware that some answering services, especially one-call environments, will resort to automatically answering (auto-answer) phone calls to get their TTA and service levels to optimal levels. This could mean that you do not receive a live answer, but rather have a recorded one. Hold time is the number of seconds your caller is placed on hold while a call is being handled. Once a call is placed on hold, hold time is the amount of time that your caller spends waiting for an operator to return to the call. This could be a matter of seconds, it could be 2 minutes, or it could be even longer. Why it matters: Frustration builds when a caller is placed on hold. Your caller hears a live voice, they are getting helped, and then get put on hold. The goal of your answering service should be to minimize actual hold time whenever possible. Another key is to not be placed on hold multiple times, regardless of how long the hold time is. Multiple holds are disrupt the flow of the call and will lead to frustration and confusion. Missed calls are a large part of why answering services are retained. Your call abandon rate is the total percentage of calls that are not answered out of the total live calls received. Abandon rate in the answering service industry is comprised of agent abandons and system abandons. • Agent abandons are calls that reach a CSR and are not answered. This could be due to inattention, poor training, improper call distribution architecture, poor staffing, and other reasons. • System abandons are when callers hang up before ever reaching the CSR. Common reasons for system abandons are long ring time, wrong numbers, or the caller changed their mind and decided to end the call. Why it matters: When you miss calls you can miss opportunities for new business, leave your clients wondering when you will call back, or even worse- have them looking to your competitors for help. Understanding how many calls are being abandoned (missed) can let you know if your answering service is doing their job by representing you when you need them. Net Promoter Score (NPS) surveys are a common way that businesses gauge client satisfaction through determining their willingness to refer them to their peers. We propose that you survey your clients and ask about their satisfaction when speaking to a company representative on the phone during times when you forward your phones to your service. This survey could include topics like professionalism, friendliness, knowledge of the company/features/offerings, timeliness of answering, and more. Surveys don't have to be expensive processes. You can use a free, anonymous service like survey monkey to set up easy surveys that get results. Most surveys grade on a 1 to 5 scale to determine the topics of interest and average the scores in each area. Allow your clients to give comments and suggestions for improvement, as well. This will give you an idea of how satisfied your clients are with your answering service, and should point out any areas of concern, such as rudeness, delay in answering, or a lack of knowledge about your products and services. Repeating this survey annually will give you an opportunity to discover trends and make judgments about satisfaction with your answering service partner. Why it matters: The impression that your clients receive when contacting your answering service is a reflection of their ability to represent your business. Opportunities to make a lasting impression happen on every phone call. Whether that impression is memorable for the right reasons is another matter. With this survey you have quantitative data to make decisions about the representation you are receiving. Many companies have employees that are in frequent contact with their answering service as part of their job. Your answering service should be an asset to your business, not a pain in your employees' sides! 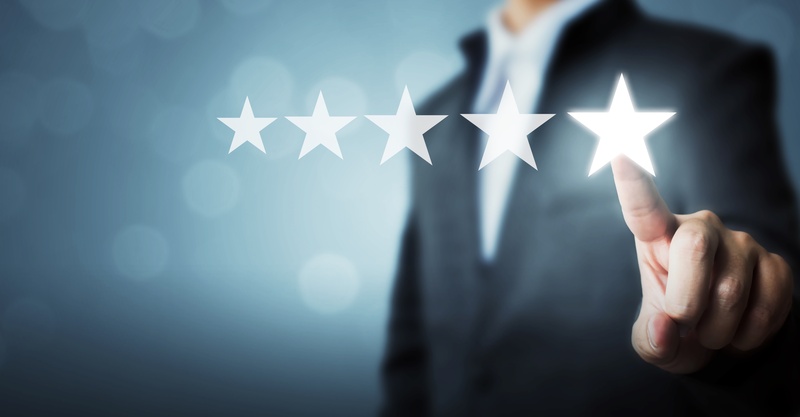 Ask your employees to rate your answering service 1 to 5 and average the results. Leave room in the survey for feedback on improvement or anyone they want to acknowledge for doing a great job! Why it matters: Employee turnover costs businesses millions of dollars each year, so reducing turnover expenses can be a huge boost to your company's bottom line. If your answering service is difficult to work with, upsetting your employees and therefore costing you to waste time and money unnecessarily, you should know about it. Proving the financial benefits of partnering with an answering service will ultimately tell you if you are making the right decision. Why it matters: Running a profitable business depends largely on the best possible allocation of resources. Understanding the return you receive from your resource investment will help you to weigh that choice against others for your business. Some popular areas where you can see gain from your answering service investment if you are working with the right partner are: increased appointments, better staffing on jobs, fewer delays in patient/client care, capturing more advertising calls, more deals won, increase in consultations scheduled, decreased supervision time, and decreased overhead.